13 Things You Need to Know Before Booking Your Engagement Photos! 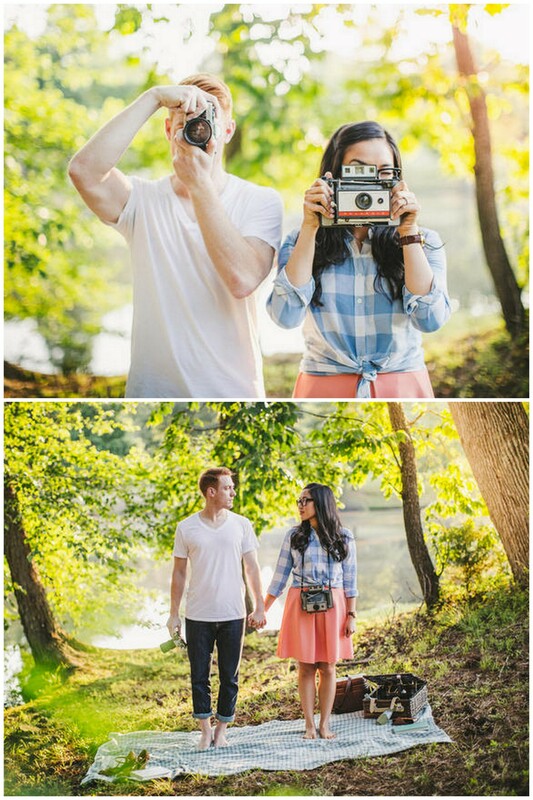 13 Things You Need to Know Before You Book Your Engagement Photoshoot! Getting engaged is such an exciting time! One of the first things newly engaged couples do is plan a special engagement photoshoot to mark the occasion. “Your engagement session is the beginning of their life together, which is why I think it is SO important to plan for it accordingly,” says Jessica Q Photography. We couldn’t agree more, so we’ve put together this list of the 13 most common mistakes couples make when planning their engagement photoshoots, and what to do instead! Don’t forget to have a plan B for bad weather. Of course we’re holding thumbs that the skies are beautiful and blue, the wind has taken the day off, and rain is nowhere in sight. But, just in case things don’t work out, Rochelle Cheever of A Romantic Journey, Italy Weddings, advises having a location your love in mind for plan B.
Don’t bring the cheesy props along. Don’t get us wrong – there is absolutely always a time and place a little bit of cheese – but your engagement shoot is usually not it. Instead of silly ‘I’m with stupid” cutouts, you can opt to incorporate something meaningful such as love letters or items which represent shared hobbies instead. Often a meaningful location is a great way to add a personal touch to your shoot. 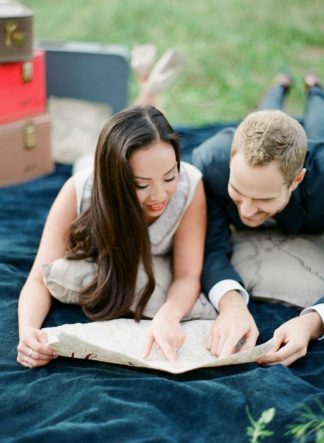 We love how this couple used their shared love for Wes Anderson’s films to inspire their engagement photoshoot in a fun way! Don’t forget to mentally prepare your partner for your photoshoot – show him your photographers work so that he knows what to expect. Typically throughout the process the photographer is communicating with the bride. “It’s the bride follows our work on instagram, and she is the one that selects the outfits for the session,” explains Emily of The Ganeys Photography. “When the groom has never looked at our work, he can be thrown into a situation he is unfamiliar with. He has no idea what to expect at the shoot. ” Emily recommenda sitting down together before the engagement session and looking through your photographers most recent blog posts or instagram feed. This will help him get a little more comfortable with what to expect. It may also inspire your outfit selection, which is an added bonus! Jessica Q Wong of Jessica Q Photography agrees: “I often see is couples being too afraid to go all the way! Your engagement session and your wedding day are the only two days where you are allowed to dress up and be fancy and feel great! 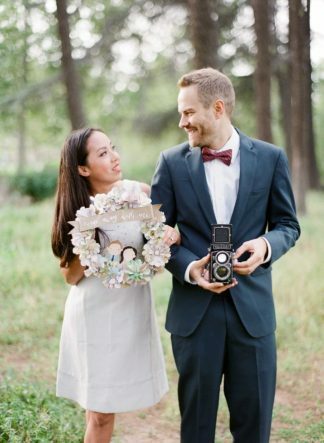 Go as fancy as you like.” These photos might be on your Save the Dates or your wedding invitations, so don’t come dressed in something super casual and then regret it later, says Jessica. “You don’t have to break the bank to dress up, but I think it’s always a good idea to put your best foot forward.” Remember, depending on where you live, you could also rent a totes glam designer gown from Rent the Runway for around $40 – $100! Don’t forget your second outfits. Samantha Clifton suggest bringing two outfits to a shoot – one casual and one more formal. That way you have a range of looks and images which better your story as a whole. 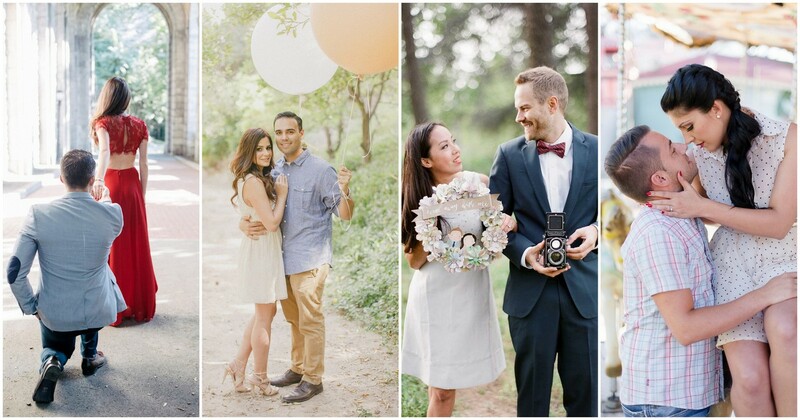 Don’t book a photographer until you know what your own photography style preference is. Do you want pics that are cute but quirky? Or dark and moody? Or ethereal and airy? “Sometimes couples request images that don’t represent the work they’ve seen on our website,” explains Emily of The Ganeys. This puts photographers in a tricky situation. They want you to love your images but if your request doesn’t fit with the style you hired them for, you might not be happy with the results. Get familiar with the most recent work on a photographers blog and Instagram feed to make sure you like what you see. If you don’t, keep searching until you find a better fit. Don’t forget to have a basic plan for the shoot. Both logistically and stylistically. 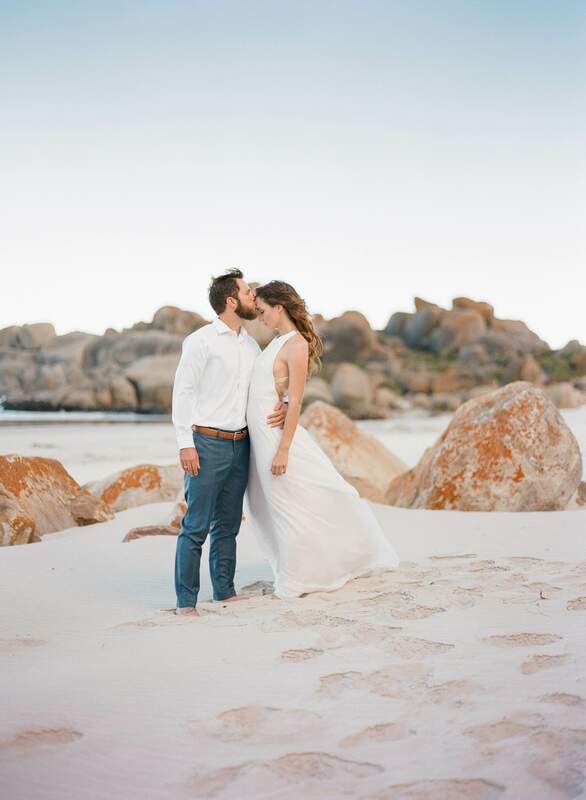 It helps to have a basic idea in mind in terms of the location you’re after, and the kind of look at feel you want suggests Lucia of D’amor Photography. Your photographer will be able to guide you as to when the best light can be found where, so you can plan around it. “Natural looking photos still require thought and purpose – remember you want these photos to last a lifetime! Plan accordingly,” says Abigail. Don’t forget to book a hair and make up stylist. The more effort you make with your outfit, hair, make-up and styling, the better your photos will come out, explains Abigail of Grace Studios. Don’t overlook travel time between multiple locations. If you’re planning on shooting at both the beach and your fave coffee house but they’re 20 minutes apart, you might have increase the number of hours you’ve booked for your session. Work with your photographer to create a realistic timeline which is practical not only in terms of travel time between locations, but that factors in time to change your outfits, finding parking and locating crowd-free spots. Read more wedding planning advice here. These are SO true! This information is spot on!